Bottom Line: If you're looking for a smart and durable shorter stature case, with a window and only plan on using 1 external 3 1/2" device and no more than three internal 3 1/2" devices then the Ultra Wizard may be the one for you. Bigger than a bread box, but smaller than a similar looking Dragon case. Ultra's Wizard takes a proven design and puts it in a smaller package. Recently, the company I work for was in the market for some new builds. 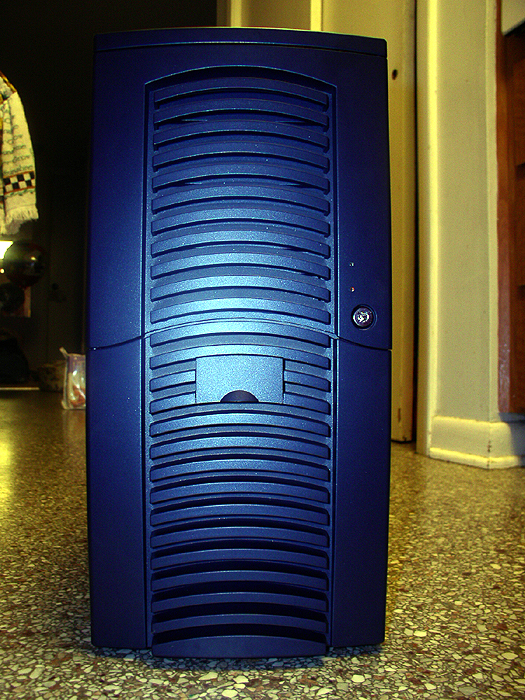 We were spoiled by our first supplier because they supplied us with a nice mini-tower case, of heavy gauge steel, blue trim (blue is the company color,) front USB and Firewire and a decent power supply for only $59. Prior to this, I was used to getting cases with razor thin edges and crappy power supplies unless we were willing to spend $100. After that supplier screwed up a few consecutive orders, we decided to look for another supplier. Most of the cases we ran into were the cheaper, flimsy cases with cheap power supplies and bland looks. Albeit they were in the neighborhood of $30 to $50 and had the front USB, it was clear that front USB does not a decent case make. We were spoiled and we had to get our fix for a decent case for our next batch of builds. A friend suggested the new Ultra Wizard. We looked at the pictures and liked what we saw. Although difficult to gauge the gauge of steel (pun intended) by looking at a photograph, we could see that the case had a sturdy look to it, had front USB and Firewire and what looked like a nice blue color. Essentially, the case looked like a Chen Ming Dragon (aka Chieftec Dragon, aka Ultra Dragon, aka Antec Performance) only shorter in stature, making it something unique to Ultra. This similarity in appearance wasn't at all surprising as this case is also made by Chen Ming, but it's good to see that they've taken a proven, accepted design and modified it to meet a particular market niche. The price of the case was $59.99. This was the same price we were paying for the other case we had been using, but the Wizard didn't come with a power supply. Knowing a decent power supply was going to raise the cost of our system by $40 to $50 we weren't too happy with having to fork out $100 or more just for our chassis solution, but we figured we'd at least take a look at it and see if we would end up with something that would give the perception of a PC that was now worth 10% more than what we had been selling in the past. We convinced a supplier to comp us an MS-Blue Wizard case, and they were nice enough to get us a case with a window, which sells for $10 more at $69.99. $10 for a window kit isn't bad at all. Sold separately, a window kit alone will sell for $20 by itself, but since we're already a few bucks over budget, a window wasn't really our biggest concern.